A Platform supply vessel (often abbreviated as PSV) is a ship specially designed to supply offshore oil platforms. These ships range from 20 to 100 meters in length and accomplish a variety of tasks. The primary function for most of these vessels is transportation of goods and personnel to and from offshore oil platforms and other offshore structures. In the recent years a new generation of Platform Supply Vessel entered the market, usually equipped with Class 1 or Class 2 Dynamic Positioning System Dynamic positioning. STX OSV Holdings Limited (“STX OSV”), one of the major global designers and shipbuilders of offshore and specialized vessels, announced that Tidewater Inc. (“Tidewater”) has acquired contracts for three Platform Supply Vessels (PSVs) under construction at STX OSV in Norway. World Maritime News – Tidewater Buys Three PSVs Under Construction at STX OSV (Norway). Vestnes FMT has received a contract for 4 newbuildings from Ulstein Verft in Ulsteinvik. Newbuildings 296, 297, 298 and 299, being built for Blue Ship Invest, will be equipped with state-of-the-art “Willy” furniture packages. 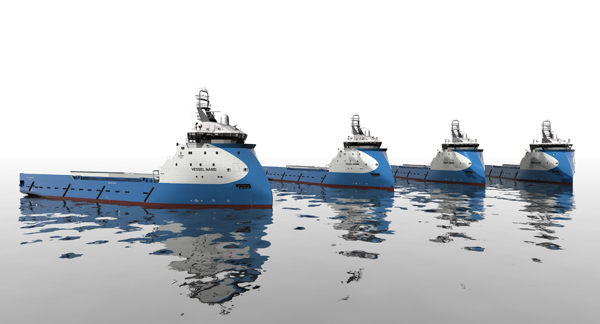 These four newbuildings are medium-sized platform supply vessels (PSV) of PX121 design and are scheduled for delivery from Ulstein Verft in 2013. Vestnes Ocean is a turn key supplier of accommodation solutions for the maritime industry. The company has developed its own concept of ship furniture named “Willy”, especially made for the life onboard, together with the designers Ralston & Bau. Shipbuilding Tribune – Norway: Vestnes FMT Secures Another Contract from Ulstein. Market trends and very good feedback from the first ship in operation triggers Blue Ship Invest to contract another four platform supply vessels (PSVs) of the PX121 design from ULSTEIN. All four are scheduled for delivery in 2013. 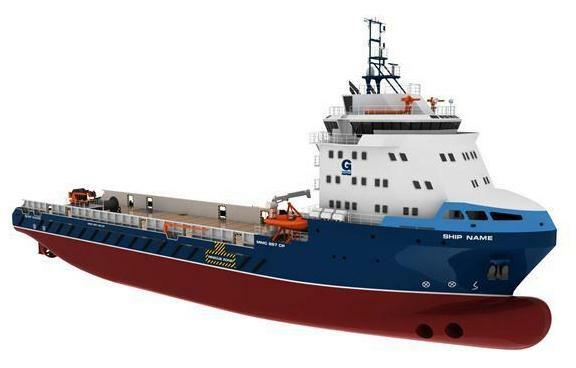 “The investment company Blue Ship Invest received its first vessel, ‘Blue Fighter’, from Ulstein Verft in January this year, and will receive the second vessel in Q3. “’Blue Fighter’ has been working for the oil company Apache for several months, and we have received very good feedback from Remøy Shipping, who manages the vessel on our behalf. The feedback, combined with developments in the PSV market, leads us to contract a series of another four PSVs of the same design,” says CEO Gunvor Ulstein in Ulstein Group. Gunvor Ulstein adds that while ULSTEIN’s expertise is in design, system solutions and ship construction, ship management is not a part of the company’s business scope. “We will make arrangements for the management of the vessels, but I emphasize that all six vessels are for sale,” she says. PX121 is a medium-sized platform supply vessel, with a length of 83.4 metres and a beam of 18 metres. It has a cargo deck of 875 square metres and a load capacity of 4200 tonnes (dwt). It has a maximum speed of approximately 15 knots and modern accommodation for 24 persons. Efficiency and flexibility has been the focus in the development of this design. The ship is adapted to the requirements for longer and deeper boreholes and activities further from shore. In addition to tanks for oil, water and drilling fluids, the vessel has four stainless steel tanks for flammable liquids. The vessel is equipped with a dynamic positioning system Class II and meets the requirements of DNV’s Clean Design and ICE-C notations. The ship is also equipped with catalysts for all four main engines. The X-BOW® hull line design offers efficiency over a wide draught range, which is important for PSVs as they frequently operate with varying loads. Moreover, the X-BOW has unique, advantageous qualities in terms of motion and propulsion efficiency in moderate and heavy seas. Both the hull and choice of propulsion system make the vessel particularly suited for North Sea and North Atlantic conditions. The medium-sized platform supply vessel ‘Blue Fighter’ of PX121 design from ULSTEIN was ordered based on trends in the North Sea market. 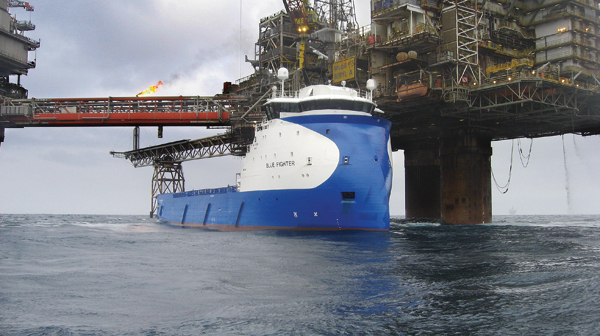 After only days of operation in the spot market, ‘Blue Fighter’ entered a one-year contract, with an option for an additional year, with the American oil company Apache for work in the North Sea. Remøy Shipping has technical and commercial management of the vessel and feedback on her seakeeping abilities is invariably positive. Ulstein Verft delivered the vessel to Blue Ship Invest in January this year.